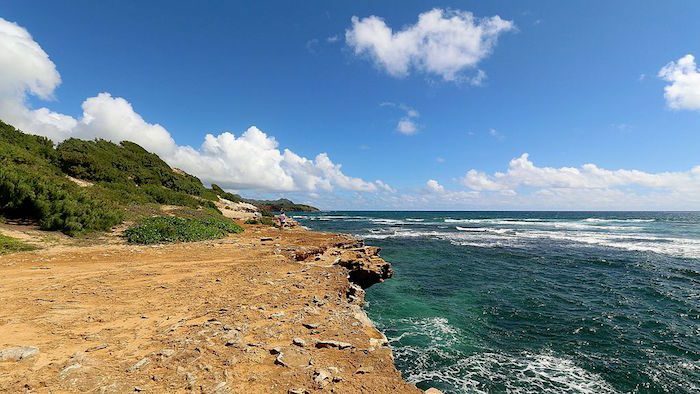 The Mahaulepu Heritage Trail, known locally as the “beach walk” runs about two miles along the coast from Shipwreck Beach up to Punahoa Point, and is a good option for anyone wanting to avoid running on Poipu streets. The trail is mostly hard packed dirt, and although narrow at times, it’s a pretty nice and even grade for running. What makes this trail special is it’s one of the last undeveloped segments of coastline on the south shore, so the stands of Kiawe trees and carved limestone inlets offer great chances to view wildlife and experience untarnished Hawaiian scenery. Start from the Poipu resort area near Shipwreck Beach and head out two miles to the remote Mahaulepu Beach before turning around. Add-On: some quiet residential roads in the Poipu neighborhood, to the west of Shipwreck’s Beach, south of Poipu Rd.